This post contains affiliate links which help support the blog. It's been three weeks since I returned to the Midwest from PARADISE. A and I hardly made it back into the country but we did and we are thankful. But, being stuck in paradise wouldn't have been that bad either. Every year, A and I plan one large trip, or at least we have for the past 3 years. First we went to Marina, CA and stayed in a beautiful Santuary, then the next year we went to Europe and traveled to three different countries, then this year we went to Costa Rica. Let me warn you though, October is the WORST month to travel to Costa Rica, the locals say. It is the green season, which means lots of rain. Honestly, it didn't bother us one bit. 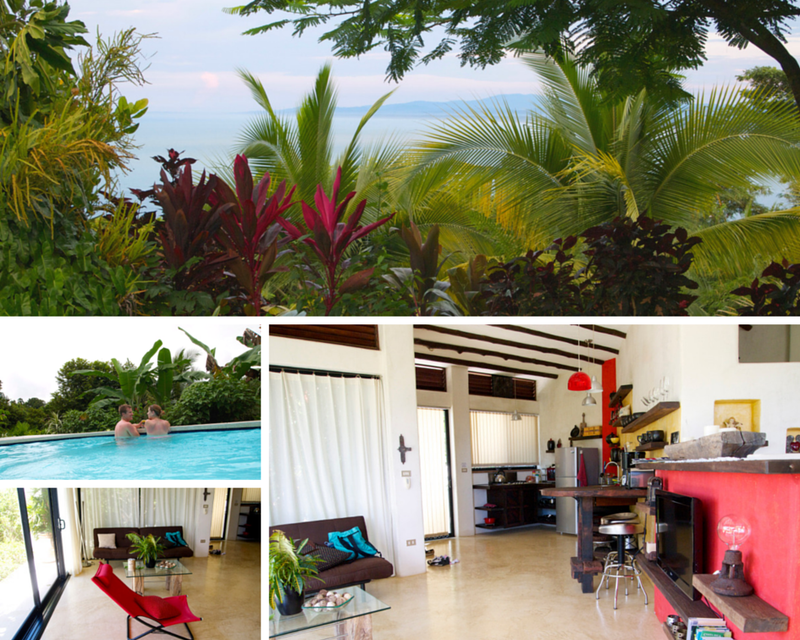 We stayed in a beautiful studio villa in Quepos that we found on airbnb.com. I can't say enough good things about airbnb and have used the site for many trips. Possibly I should write another post to talk about how great the site is! Okay, back to the villa. It was close to the top of a mountain between Quepos and Manuel Antonio, however, the only road to get to the villa was from the town of Quepos up the mountain that is hardly paved. We arranged for a private shuttle service to drive us the 2.5 hours from the airport to our villa. The shuttle dropped us off at the villa which had spectacular views. Not only did we have great views, but we also had a beautiful pool to relax in. Everyday there was some kind of new animal that would show up in the backyard of the villa; squirrel monkeys, lizards, birds (including toucans), house geckos and so much more. That really was the best part about staying in the jungle. 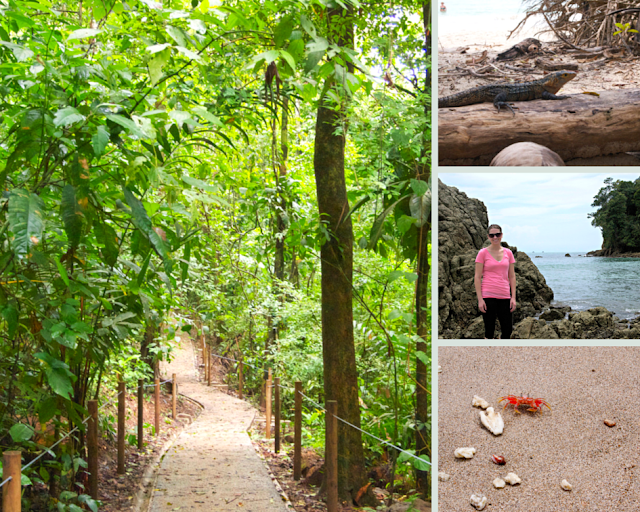 We took the public bus from Quepos to Manuel Antonio National Park twice. The park was beautiful and we felt the urge to go twice. The bus ride over was only 315 colones ($0.58 USD) and the park was $10 per person - I'd say that's a cheap excursion. There was so much greenery and wildlife to look at in the park. My favorite were the crabs on the beach. I was amazed to see all the different age groups walking around the park because as a 26 year old that works out, I was struggling on some of the hills to the beach. I'm going to blame it on the humidity - you could cut it with a knife. Everyday we would walk from our villa to town. It was only a 15 minute walk downhill and nearly impossible to walk up; we always took a taxi back. On the way to town we would pass Marina Pez Vela which had amazing views. We scheduled a sailing trip that included snorkeling, lunch, and booze. There were only had about 15 people on the boat, including the staff, and had a blast. Also, the food was amazing - casados all the way! Our last excursion was zip lining. Unfortunately, I do not have any photos because A and I were having too much fun. Remember when I said that traveling to Costa Rica in October was the worst month to go? Well that also meant that we were the only tourists in town, so we had our own personal zip lining tour. At the end of the tour, they served lunch and allowed you to walk their gardens. Can you spot how pineapples grow in the last photo above? 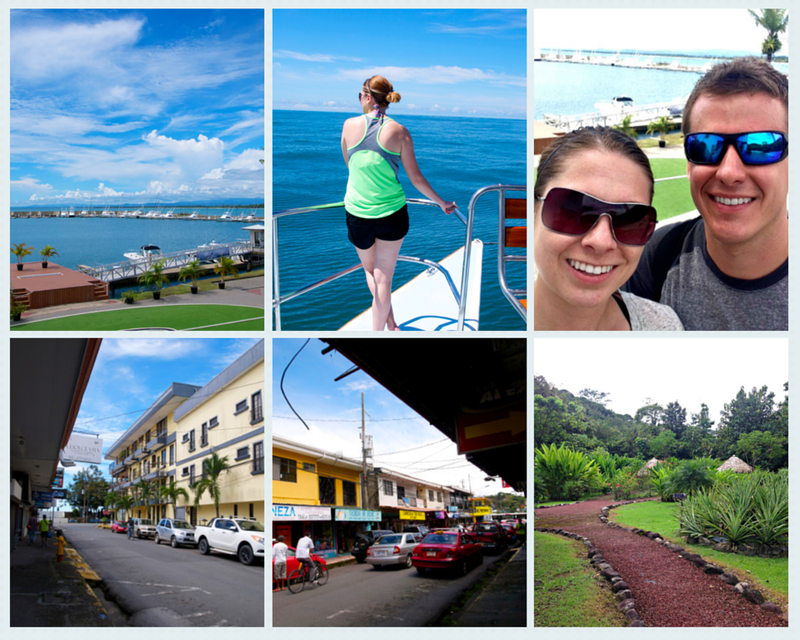 It was finally time for us to say our goodbyes to Costa Rica. Or so we thought! We got to the airport and they asked us to stay another three days because all of the flights were overbooked. We fought our way out of the country and dealt with 30 hours of traveling - it was a nightmare. This trip was a completely new experience and I loved it so much. Now I need to figure out where we will travel to next. Any ideas? ugh these pictures look gorgeous!! I've never tried airbnb but i've heard such great things! It is absolutely amazing there. Also, airbnb is awesome but it does take some time to research and a little faith to trust the person. We have used 3 different hosts in the last 2 years and don't have any complaints! soo pretty, that looks like such a great trip. I can agree with you on airbnb, amazing website. I would give anything to go back there right now. Plus I am seeing snowflakes outside the window as I type. :( You are right, airbnb is the bomb dot com! Your trip looks like it was amazing!! Costa Rica is on our list for sure! Mendi went to London and Paris this year and is thinking of a tropical vacation next year. And I didn't take a vacation this year as we were building a house but hope to plan something next year. Last year I went back to Puerto Vallarta, MX and just love it there. I got married there 5 years ago. Can't wait to see where you end up going. If you two ever get a chance to go to Costa Rica, you must go! Make sure to give yourself extra time to get home because the airport is a nightmare. Puerto Vallarta sounds fun. Do you guys normally stay at an all inclusive when you go?